Solar String Combiner Box in Chennai, India from GEESYS Technologies (India) Pvt. 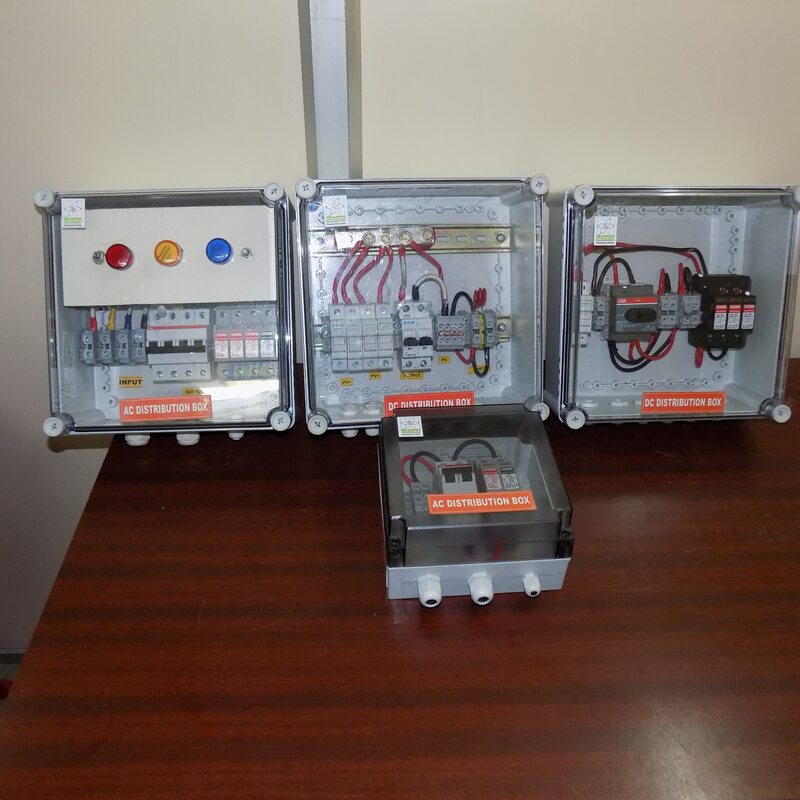 Ltd.
GEESYS offers array junction (DC combiner) boxes that provide interconnection between the input leads from the solar PV modules, and the output lead to the re-combiner box or inverter. The combiner box is customized for different configurations, based on the number of strings of solar PV modules used in the PV layout. For a set of 10 PV modules arranged two in series and five in parallel, a 5:1 configuration combiner box is selected. The combiner boxes consist of the following key features: IP65 Enclosure: The combiner box enclosures are typically made out of thermoset (GRP or polyester), or thermoplastic (polycarbonate) material, and come with IP65 protection. Enclosures come in different sizes, depending on the number of input strings and protection features implemented in the combiner box. Fuse Protection for Strings: DC fuses rated from 2A to 25A from leading manufacturers are used in the combiner box to provide overcurrent protection. Fuses can be provided with or without indication. Surge Protection Device : Surge Protection devices or SPD’s in the combiner/junction box protects electrical and electronic equipments from the power surges and voltage spikes. Surge protection devices divert the excess voltage and current from transient or surge into grounding wires. SPD’s used by Nordic Asia in the combiner boxes meet Type 2 regulations, and are typically rated between 600 to 1000V. DC Disconnect/Isolation: An accessible disconnect/isolator switch is recommended for placement before the inverter to disconnect the DC side of the system when maintenance is being performed on the inverter. Cable Glands/Connectors : The combiner/ array junction box offered by Nordic Asia is provided with IP 67 rated Cable Glands or MC 4 connectors at the input and output side to terminate the array strings into the box. String Monitoring (Optional): Our String Monitoring Combiner Box uses non contact Hall sensors for the measurement of string currents. The string currents measured are accessible over MODBUS through a RS-485 communication port by central monitoring/SCADA software.